Thank you to Two Writing Teachers for hosting the March Slice of Life Challenge. 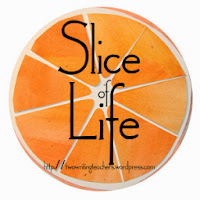 I am joining other bloggers and writing a Slice of Life story each day in March. At dinner each night, we play the High/Low game. Each person tells his high and low for the day. We've played the game since our kids were little. After they moved out, Keith and I ended our day sharing our highs and lows before we turned out the lights. We have continued the game with the girls. When it was my turn, I shared my highs and lows...I got to work early this morning and got caught up with some things I've been promising teachers. My low...I needed to email Dr. Bloome. After everyone else had shared, I told the girls that Keith and I had made a big decision. "I'm not going to go to school full time next year." The day has been a little emotional as I grieve the loss of a dream I had, but celebrate that a decision has been made and it's what's best for the girls. I'm not quitting, just taking it slower than I had anticipated. Destiny asked me what I meant. I told her that I was going to take a bunch of classes, but now I wasn't. I would just take one at a time. A little smile emerged as she said, "Good, now you can spend more time with us." That was my new high. My heart filled as I knew for sure we had made the right decision. I'm sorry that one dream is slowing down, but I think Destiny's comment speaks volumes about the effects of the decision you did make. Oh....my heart just skipped a beat, Julie. I believe in my heart that you are doing the right thing. That validation from Destiny has to be so comforting! Dreams don't go away, sometimes they just take a little longer that we expected. I juggle that each day! I already am out one night each week for work and I feel that it is one too much! Glad your low became a high! Oh, Julie. That's just what you needed to hear! I'm so happy for you both. I know it was a difficult decision, but those precious words ... "Good, now you can spend more time with us" mean everything! Julie, I know those words meant so much. Blessings as you move forward with your decision. It takes a lot to be committed to children...may you have all you need along the way for the daily decisions and may you have contentment. Maybe one class at a time is a message to take each day at a time. You are a blessing to these girls.